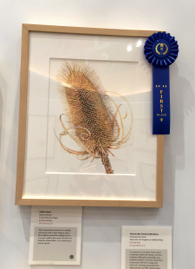 People’s Choice first place award went to Estelle DeRidder’s, Fuller’s Teasel, Dipsacus fullonum, colored pencil on paper, © 2015 Estelle DeRidder, all rights reserved. During the opening reception for the adjunct exhibition by the Botanical Artists Guild of Southern California (BAGSC), friends, family and the public were able to vote for their personal favorites. The votes are in and the ribbons have been hung for the last three days of the show, Friday, 7 August – Sunday, 9 August. 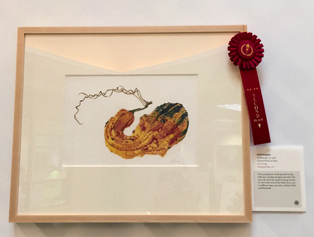 People’s Choice second place award went to Lori Vreeke’s, Field Pumpkin, Cucurbita pepo var. ovifera, colored pencil on paper, © 2015 Lori Vreeke, all rights reserved. First prize went to Estelle DeRidder’s Fuller’s Teasel with 16 votes. Second prize went to Lori Vreeke’s Field Pumpkin with 12 votes and third prize to Asuka Hishika’s Black Daikon Radish with 11 votes. There were a surprisingly large number of votes cast (191) and the votes were distributed throughout all the artworks in the show. It is clear that there are many different themes and media that appeal to different viewers, but everyone agrees that the chosen works are fabulous! 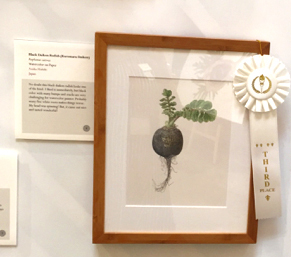 People’s Choice third place award went to Asuka Hishiki’s, Black Daikon Radish (Kuromaru Daikon), Raphanus sativus, watercolor on paper, © 2015 Asuka Hishiki, all rights reserved.